Like a soft fingertip Swedish massage, the PDC Spas exclusive Air’assage™ air therapy caresses every inch of your body for a complete feeling of relaxation. Unlike deep tissue hydrotherapy, the Luxury Series Air’assage™ feature delivers soothing massage action with oxygen filled bubbles for comfort and healing. With Air’assage™, tiny oxygen-laden bubbles fill the hot tub delivering all the benefits of oxygen from boosting skin cell rejuvenation for a younger looking you to renewed energy levels. Click here for more info on this exclusive feature. 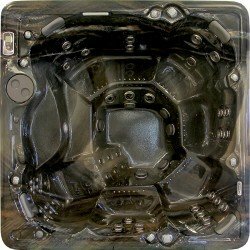 PDC Spas builds this unique air therapy system into each of the Luxury Series models with a molded fiberglass channel, delivering warmed air through up to 73 outlets in the seat, thigh and calf areas of the hot tub. Although this is an additional manufacturing cost, the Air’assage™ system is one PDC Spas feels a hot tub owner should not be without.